The painting was painted by Savrasov in 1873-1874 in oil on canvas. Painting style is realism. Genre – genre painting. Savrasov is one of the great artists of the 19th century. He left invaluable work for our country. The formation of his work came at the dawn of the landscape genre in Russia. Discoveries are always hard. One is not the right step and they will forget about you forever as an artist. But Savrasov, like Shishkin, could not only reflect in his work a love for his native motives, but also bring it to the viewer. On the plots of their canvases written many poems and prose. These artists glorified the beauty of Russian nature and the strength of the soul of our people. Savrasov’s canvases are known to everyone in our country. The picture “The Rooks Have Arrived” is known from the school literature course. 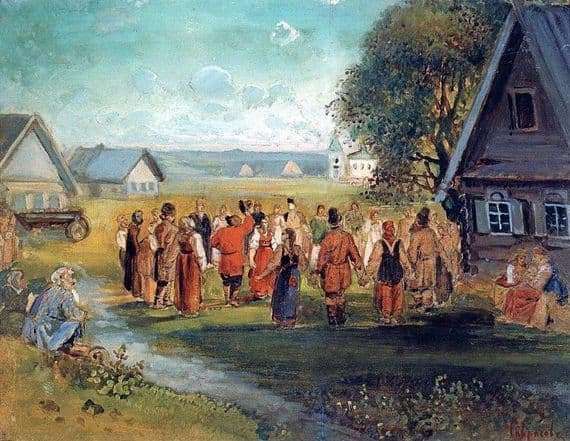 The work “Round Dance in the Village” shows the viewer the simple rural life of the past centuries. Young boys and girls spent their time leading round dances, singing songs, jumping over fires. The elderly people sat and rejoiced at the cheerful guys, remembering their young years. The clothes of the Russian people were simple, but very beautiful. Each women’s sundress or men’s caftan was embroidered with handmade patterns. They were all different from each other. The clothes were modest, but very cute and bright. The girls wove wreaths, and the boys were engaged in wood carving. Everything in this life was simple and romantic. Savrasov was filled with love for Russian culture and nature. His canvases warm the soul and make me sad about the times gone without a return. In those times where there was no aggression, lead and anger. Savrasov skillfully conveyed the mood on his canvases. His examples in painting made the plot realistic. Savrasov left us his work, so that we could understand how beautiful life was in Russian villages. The canvas is stored in the State Tretyakov Gallery. Moscow.